Back from another fishing trip to Cornwall ! Not a great catch again, but I have put 6 good size fillets of pollack in the freezer this morning.We don't go again until 7th June so I shall concentrate on the gardens now while the weather is favourable. I expect the family for tea today, so I bought a ham from the butchers in Callington, very reasonably priced at £6.99 and will easily feed us all, with lots of veg and a cheese sauce AND an onion sauce ( have to please everybody) ED is bringing a cheesecake and I shall make a steamed ( in microwave for 5 mins) sponge for those that like a hot pud. I now have 6 hens sitting and four lots of chicks born, not big broods, just twos and threes, but enough to keep us replenished and maybe even sell a few later when we see if they are girls or boys! The lambs continue to do poorly, so they are still on three bottles a day to help them along. I expect YGD will want to help in the garden this afternoon when she gets here. her choice of jobs will be, mucking out rabbits, making cement for her grandad or planting bean seed in pots. ED and YD will be starting to de-thistle the paddock as we are now on countdown (8 weeks) to our FAMILY FESTIVAL!!! This is a party that started some years ago and has grown and grown. People started to bring a tent so that they could have a drink and one year when it rained and rained ( no NOT last year!) and there were a dozen tents in the paddock, someone said "it's getting like Glastonbury" and that seems to have stuck, so it is now called "The Festival" We have games and races, there is usually a river challenge and family members sing and play on the stage (a floor made of pallets) while the rest of us dance the night away. last year we also had Zumba, which we are definitely having again this year. As a child falls asleep it is rolled into a tent and all are safe. Last year 220 people came and there were 35 tents and we had to borrow our neighbour's field for the cars, so we need to ensure as much of our paddock is fit for camping/ dancing/ races as possible. Hence the de-thistling today while the plants are small. Most of my seeding has been done in pots and trays in the greenhouse and now is the time to get some plants in the garden and free up space in the greenhouse for staring the bean plants off. 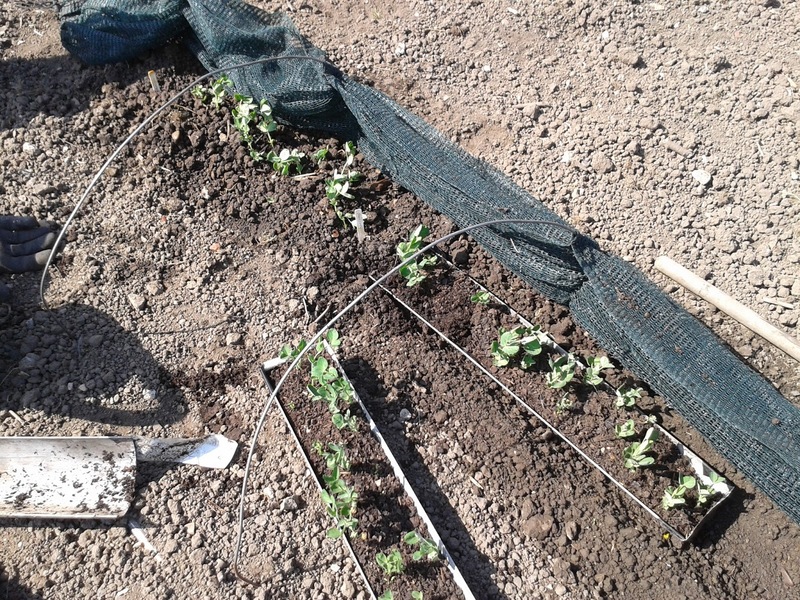 So today I have begun to plant the pea crop. Perhaps you remember when I used Child Labour to start off the peas in guttering ? 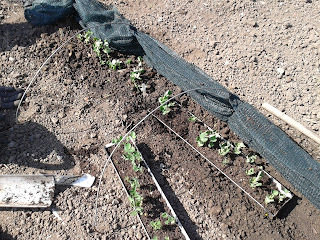 Below is a pic of those sprutted plants going into the garden. I wet the soil in the guttering, undid the gaffer tape from one end and slid the mini-plants into a trough made with a hoe. After watering in well I covered with a netted cloche to keep off as many critters as possible!. On a different subject, my padded jacket finally gave up the ghost today and is beyond mending even for me! So I have made polishing cloths ( friends will snigger at that as I don't do a great deal of polishing!) with the larger pieces. 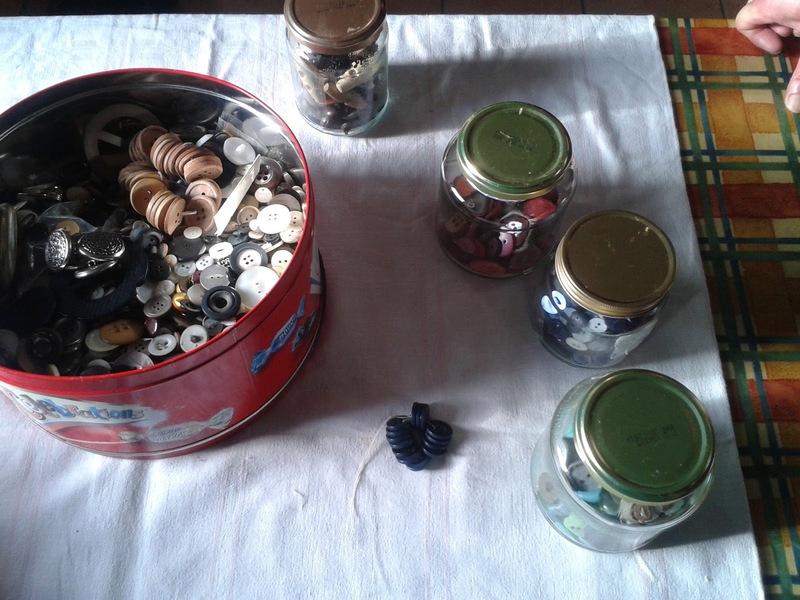 There is also quite a haul of buttons,which minded me of how important a Button Tin is. Below is a picture of my button tin. This haul is the cumulation of 47 years of marriage and the addition of my mother's button tin. In the jars ( sorry about the quality of the photo) are different colours seperated out, red, blue and green and a jar of toggles and leather or wooden buttons. This sorting was done by Adam (shared lives) on a cold day and he spent hours doing it, loving a job that made sense to him and was useful to me. In the middle you can see the buttons I took off my jacket today. in latter years I have started to thread all sets of buttons as I take them off, which saves sorting through the tin at a later date. Over the years the children, grandchildren and foster children have had hours of interest and fun with the button tin and I can't remember when I last bought a button. I am sure many of you can think of games, crafts and educational tasks that can be done with the Button Tin. Another lovely day here in deepest Derbyshire, must go now. I reckon there is something very satisfying about owning a button tin passed down from generation to generation, but I doubt any of my 3 would know what to do with it nowadays. No crafting things at schools they went to in the 80's/ early 90's,very sad. I'd rather come to your festival than Glastonbury any day! We've got lots of buttons here but not sorted as nicely.